Hello friends!! 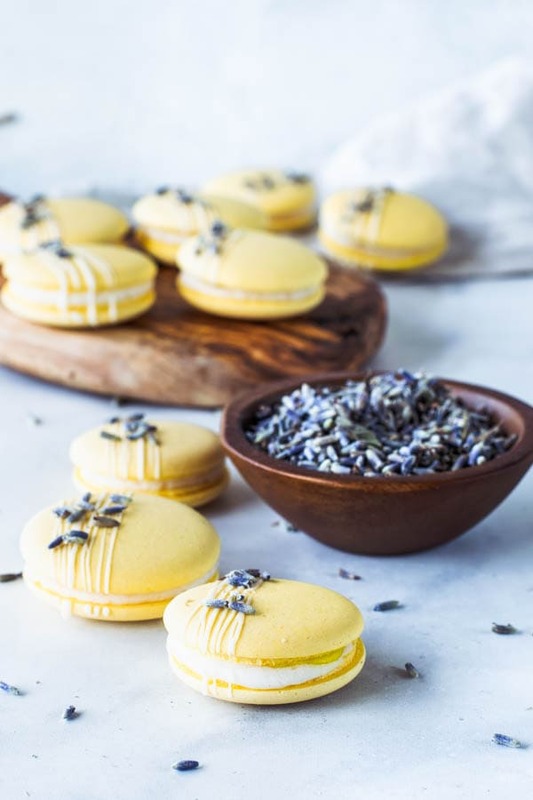 Here we have some delicious Lavender Lemon Vegan Macarons! And I am also talking a little bit about growth mindset down below. I have been on a macaron baking train. And I have also been on a vegan baking train. So combining both baking trains was the logical thing to do. In the past few weeks, most of the recipes I have been posting are macaron recipes. I have also posted two different vegan macaron recipes lately. 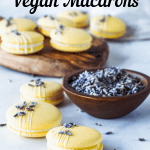 This Lavender Lemon Vegan Macarons is the third one I post on my blog. But won’t be the last, that’s for sure. Last week I posted Salted Caramel Vegan Macarons, and a couple weeks before that, I posted my Avocado Vegan Macarons, with a chocolate avocado filling that’s hard to resist. If you would like some tips on how to make Vegan Macarons, you should definitely check out my last post with my Salted Caramel Vegan Macarons, where I give some precious tips about how to make vegan macarons. See, making macarons is known to be a very tricky and complicated subject. Are macarons really that hard to make? And better yet, are vegan macarons hard to make? The answer is: yes! BUT it gets better. And easier, as you practice. Just like with anything in life. When you adopt a growth mindset in life, you understand that learning is a process, and making mistakes are fundamental to mastering anything. I avoid having a fixed mindset about anything in my life, including my learning processes. But I wasn’t always this way. It wasn’t until last year that I have made a conscious decision to transition to a growth mindset, instead of a fixed one. The thing is that before, I wasn’t even sure what fixed and growth mindsets were. And I didn’t even know I had the option of changing. Not having a fixed mindset is hard work, specially if you grow up in this mindset, which becomes engrained in you. So I have to constantly check myself, every minute of the day. With every thought, about others, and myself. Lots of things in my upbringing framed me in a fixed mindset. One of them was that I grew up hearing my parents and teachers tell me how naturally smart I was. And when you are a kid who keeps hearing how naturally smart and talented you are all the time, you become afraid to take chances, get out of your comfort zone, and make mistakes. Because you are afraid you will disappoint someone, and they won’t think you are talented and smart any longer. And therefore, you don’t evolve as much as you could, because without making mistakes, there’s no evolution, really. What made it worse for me, is that I suffered some heavy bullying in school, and I didn’t have a lot of friends. So holding on to my “smart status” was very important, because it seemed to be the only thing I had going for me. I am not blaming my parents or teachers for this, I appreciate the fact that they were trying to build my self-esteem. But now I know. Which is why you will never hear me telling my son how smart he was, or that he knows everything. I tell him he is a good learner, I tell him it’s good to be curious, make mistakes, and work on getting better. We are not finished products, we are “works in progress”, and I would rather live my whole life making mistakes than never making one because I didn’t take a chance. I always have people tell me: I can’t make macarons, they are too hard, I am too afraid, they seem too complicated, I will probably fail, I am not a good baker, etc etc etc. I’ve heard it all. I wasn’t born knowing how to make macarons, and it took me a journey of many years to get good at baking in general. And what I wish for everybody out there, and you reading this, is that you strive to be a learner, strive to be better everyday, instead of thinking you have to get things right at the first time (or the second, or third). If you like this mindset topic, I recommend the book Mindset by Carol Dweck. It’s a must-read in my opinion. 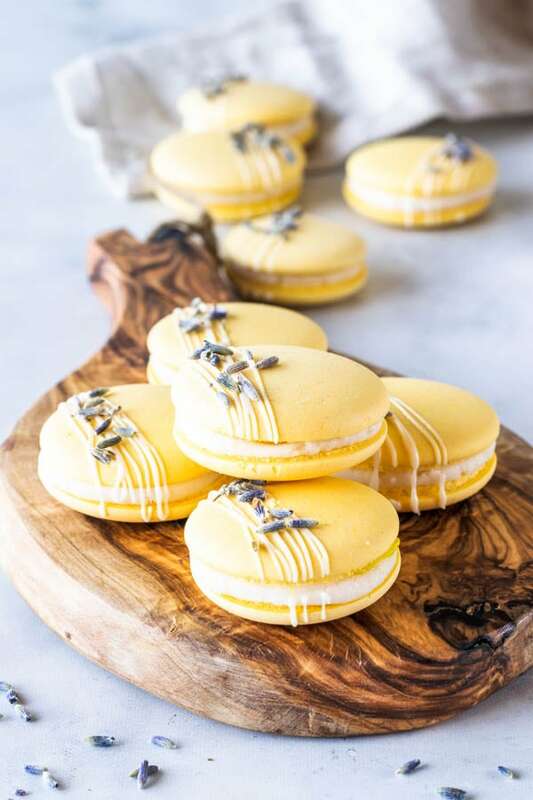 Anyway, now let’s talk about these Lavender Lemon Vegan Macarons at once. The feet on my vegan macarons have been coming out a little more subtle than on my regular macarons. I feel like when the batter is a little bit more wet, the feet are smaller. When I whip the aquafaba longer in the initial state of the process, the feet come out a little better. They came out so beautiful on my Salted Caramel Vegan Macarons. It was my best batch by far. I noticed that I didn’t whip the aquafaba as much with my lemon macarons, which made the batter a little bit more liquid, and maybe that’s why the feet were smaller. We will keep testing, and improving. If you make my Lavender Lemon Vegan Macarons, or any of my vegan macarons or recipes, for that matter, please tag me on instagram @piesandtacos, so I can check out what you’ve made! It makes me super happy to see people making my recipe. I am so grateful everyday that so many of you like my recipes and take the time to make them. 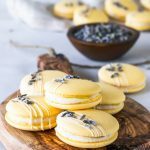 These macarons are filled with a Lavender Vegan Buttercream, and a Vegan Lemon Curd, both super easy to make. The vegan lemon curd was hard to stop eating with a spoon! So delicious! My regular Lemon Macarons recipe is my most popular recipe in my whole entire website. And I am so happy I get to bring a vegan version today! 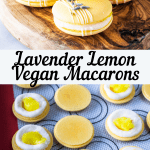 If you don’t like lavender, simply leave it out and make these simply Lemon Vegan Macarons. It will work out beautifully. I added the lavender because I wanted to make these macarons have a spring vibe to them. Call them Spring Macarons if you will. 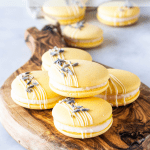 It’s been almost one year since I’ve posted my first Lemon Macarons recipe here on the blog, it was also spring, and I was also in the mood for bright lemony desserts! To check out some more vegan dessert recipes, click HERE. I really hope you loved today’s recipe for my Lavender Lemon Vegan Macarons. Thank you for coming to my blog, and reading my posts and recipes. I appreciate each and everyone of you that visit my blog! This page contains affiliate links. Which means that every time you make a purchase of an item you clicked through my website, I receive a percentage from Amazon. 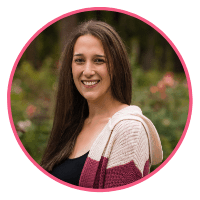 It doesn’t cost anything extra to you, but helps my blog! Thanks! 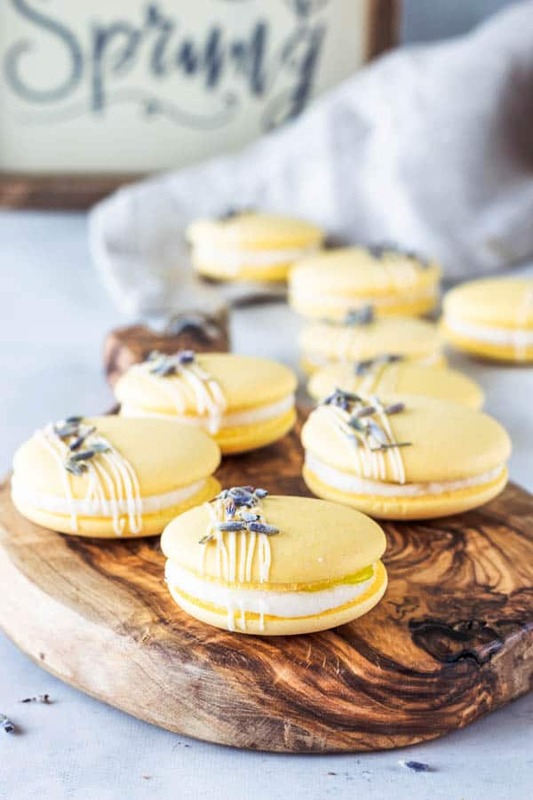 Lemon Lavender Vegan Macarons are here to celebrate spring! 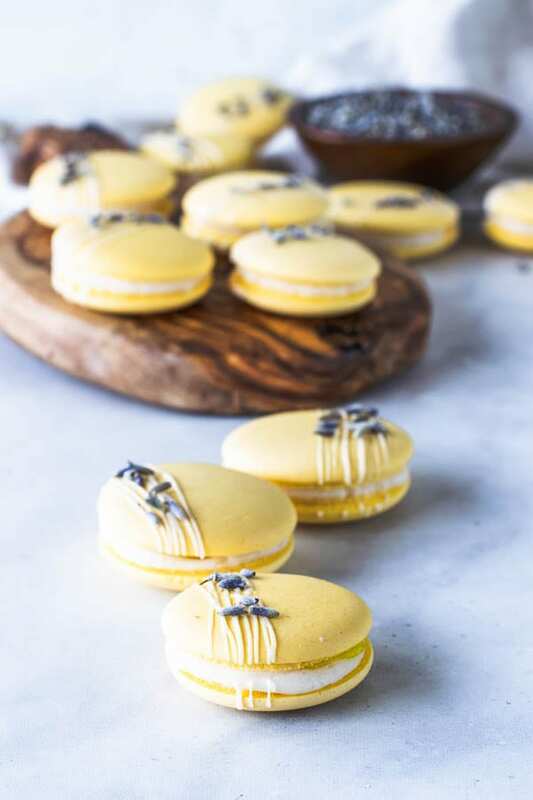 These vegan macarons are filled with a vegan lavender buttercream, and vegan lemon curd. Place your aquafaba in a small saucepan. Bring it to a boil over medium heat. Let it reduce and thicken, while stirring from time to time to check the consistency, over medium low heat. You are looking for a gentle simmer. Once the mixture has reduced til about half, you can remove from the heat. The aquafaba should have kind of a slimy consistency, such as egg whites. Set it aside until it cools completely to room temperature. Measure out 100 ml of the prepared aquafaba. If you have any leftovers, store it in the fridge for up to 3 days. Sift almond flour and powdered sugar together in a bowl. Divide the aquafaba in half. Mix 50 ml of the aquafaba with the almonds and powdered sugar. Use a spatula to mix until this becomes a thick paste. Add food coloring at this point, if using any. Place the other 50 ml of the aquafaba in the bowl of a stand mixer. Start to mix on low, raising the speed gradually to medium-high. Whip aquafaba until it reaches stiff peaks. 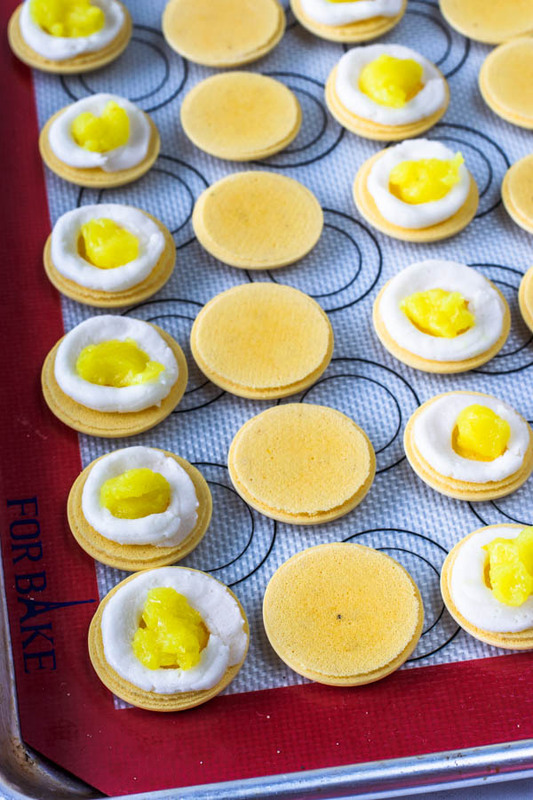 They won’t get as stiff as the peaks in the egg white meringue do. But you will be able to recognize it as a stiff peak, because the whisk will leave streaks in the meringue, and you’ll be able to identify some medium to stiff peaks in your meringue. The mixture will be white and fluffy. While the meringue whips, you want to move quickly to make the syrup. Mix water and white sugar in a small saucepan. Place a thermometer on the side of the pan.If your thermometer doesn’t reach, you might have to hold a thermometer in place while you cook the sugar syrup. Bring it to a boil over medium heat, until it reaches 245F. Don’t stir the mixture at all. You may rotate the pan if the heat isn’t being evenly distributed. Do it slowly. The problem with doing this is having the risk of forming sugar crystals, from the movement. Which is why it’s recommended you have a clip on thermometer to help you check the temperature of the syrup. If you have to hold the thermometer in place, make sure to move as little as possible, so you don’t form sugar crystals in your syrup. The temperature won’t take too long to get there. Once it reaches 245F remove from the heat. It’s best if the syrup reaches 245F at the same time as the aquafaba reaches stiff peaks. For that to happen, I always find best to start whisking the aquafaba first, and then quickly starting to make the syrup. Once the stiff peaks are reaches, and the syrup has cooked til 245F, you may turn the speed in the mixer to medium-low. Start to add the syrup to the aquafaba, with the mixer on. Try not to touch the sides of the pan. Try to pour it directly into the aquafaba. Raise speed to high once all syrup has been poured. Whisk on high speed for about 10 minutes. Once mixture looks glossy, fluffy, and has reached stiff peaks, your meringue is ready to go. Pour meringue over almond flour paste. Mix with a spatula, doing a J-fold, until incorporated. A J-fold is when you fold coming down through the middle of the bowl, drawing a letter J with your spatula, and just consistenly do that motion, stopping to scrape the spatula every once in a while. Let your trays sit for a while so the shells will dry out a little bit. This vegan macaron batter takes longer to get dry than my regular French macaron, using the Swiss method. But probably around 30 min-1 hour depending on how humid the day is. 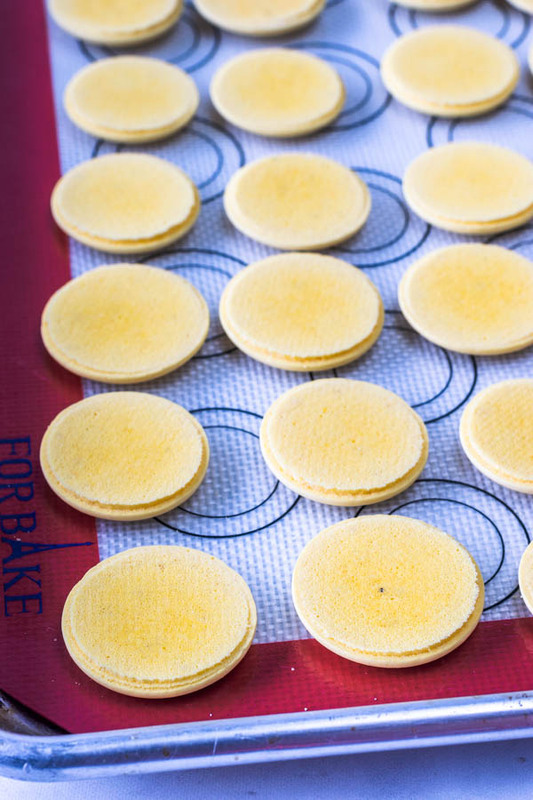 You’ll know they’re ready to be baked when you gently touch the surface of a macaron and it seems dry. Pre-heat the oven to 210F. Bake for 6 minutes, rotate tray. Bake for 6 more minutes, check if it needs to be rotated again. You will know if it needs to be rotated again depending on how the macarons are baking. Take a look at them, if one side seems taller then the other, maybe you have to rotate the tray again. Bake for a total of 30 minutes. Really keep an eye out, checking to see if it’s baking evenly. Your oven might be very different than mine. Turn the oven off after the 30 minutes, and leave macarons in there for another 20 minutes. Place lemon juice, lemon zest, and sugar in a small saucepan. Bring mixture to a boil over medium heat, stirring constantly until sugar is melted. Mix cornstarch and cold water. Set aside for a second. Once sugar is melted and mixture starts to boil, add cornstarch mixture to the pan. Bring mixture back to a boil, stirring constantly. Add a pinch of turmeric to make it a nice deep yellow color. Cook mixture for one or two minutes over medium-heat, stirring non-stop, until thickened and smooth. For a second, in the beginning, it might seem like the mixture is lumpy, just keep stirring and it will come together. Remove from the heat. Add coconut butter and stir until coconut butter is melted. Transfer mixture to a bowl. Let it cool down completely. Cover and refrigerate until ready to use. Place lavender and coconut cream in a microwave safe bowl. Microwave for a few seconds until the cream heats up. Let lavender and coconut cream infuse for a while until the cream cools down. Strain cream and discard lavender buds. Let cream cool all the way down before adding it to the recipe. Place vegan margarine in a mixer bowl. Cream at medium-high speed for one minute. With the mixer turned off, add powdered sugar and cream to the bowl. Raise speed and cream until fluffy. If buttercream is too runny, consider adding more powdered sugar to it. Add vanilla. Mix to combine. Place buttercream in a piping bag fitted with a small round tip, or simply cut a small hole at the end of the piping bag. Pipe a circle of buttercream around the edges of the macaron, in a way that you have a little hole in the middle. Fill the little hole with a bit of lemon curd. Don’t overfill it. Place another shell on top. To decorate, you can drizzle some vegan white chocolate on top and decorate with dried lavender. These Blueberry Macarons will be at their best up to 4-7 days in the fridge. *Best kind is aquafaba from canned chickpeas, without salt, or low sodium if without salt isn’t available. Pelo amor de Deus, ficaram fantásticos!!!!! Parabéns Ca!!!!! Thank you Christine! I totally agree!!! Have a fantastic day! It was a wonderful read😊 I need to change my mindset about a lot of things including trying my hands at baking macarons 😊 Thank you❤️ Lots of love to you! You are an amazing woman Cam! Thanks for inspiring me and many others! Beautiful macarons and what an inspiring post Camila! Thank you so much Tasha! I really appreciate it! !